Buffalo chilli and grilled cheese combo. add a Mountain Melt starting at $6. Melts with sides start at $10. 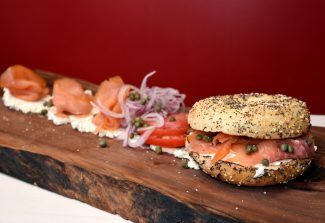 It may seem as if Vail has shared all of its secrets, but one gem remains remarkably below-the-radar: Grill on the Gore. 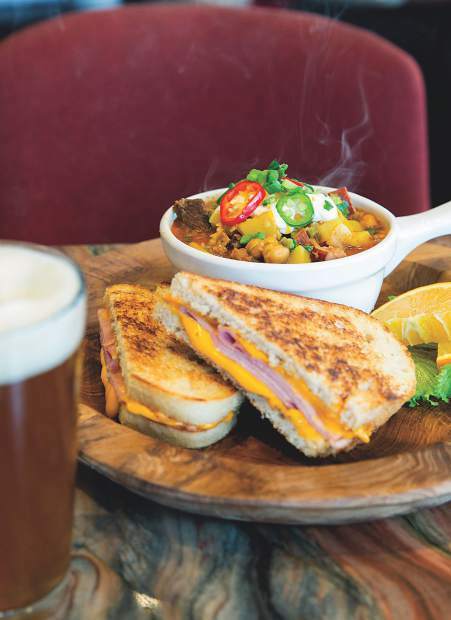 For those who enjoy gliding along on cross-country skis or exploring by fat bike, perhaps you’ve already discovered this oasis of comfort food and camaraderie. If you haven’t, you’re in for a treat. 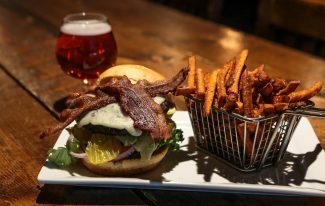 With views of the Gore Range that might steal your breath more quickly than a vigorous lap at the Vail Nordic Center, Grill on the Gore is an ideal spot for a leisurely lunch or a quick and satisfying stop when time is of the essence. 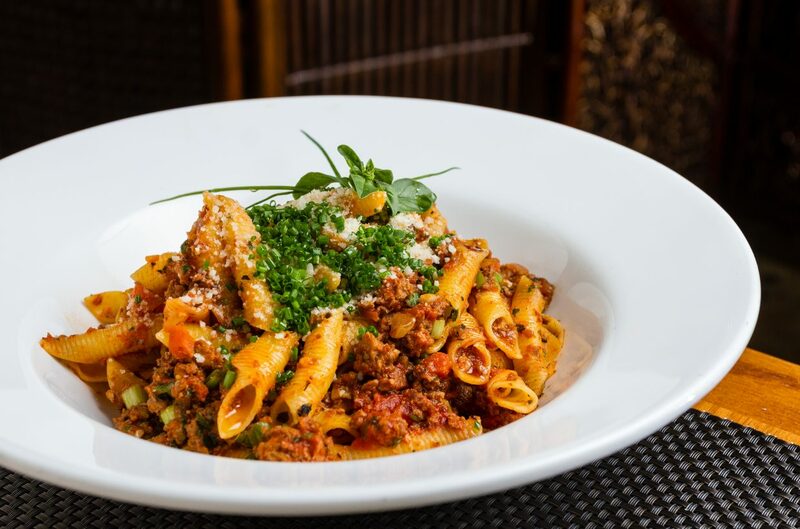 Following the idea of “give the people what they want,” Grill on the Gore is home to one of the best lunch deals in Vail with its soup buffet, offering hearty, classic comfort food made with the best (often Colorado-based) ingredients. Three different soups are available: the signature buffalo chili and two other options that change daily, such as the vegetarian roasted red pepper bisque with gouda and the lighter Italian wedding soup. The signature buffalo chili is a perfect example of chef David Sanchez’s culinary style. It’s his own version of chili, rooted in his grandmother’s Spanish bean soup recipe. Flavors are layered starting with the onions, garlic and green bell peppers (the holy trinity of Spanish cuisine called sofrito) and braised buffalo, buffalo sausage, chorizo and smoked ham. Saffron gives potatoes their golden color, and garbanzo beans add a unique texture to the chili. 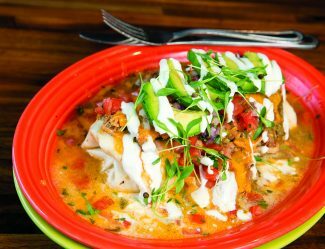 It’s unlike any other version of this classic comfort food, showcasing the passion and attention to ingredients and detail that are inherent in Sanchez’ cuisine. The opportunities to customize the soups are endless: Adorn it with toppings such as pico de gallo, jalapenos, scallions, sour cream or cotija cheese; artisan bread, homemade gluten-free chips (made from cauliflower), chicharrones, corn tortilla chips and three types of cornbread (including cowboy cornbread, studded with jalapenos and cheddar cheese) are also on offer. New this winter, chef Sanchez is offering six different spins on the classic grilled cheese. These Mountain Melts are available as an add-on to the soup buffet or as stand-alone sandwiches, served with fries. The Cautionary Melt is the classic version with white bread and American cheese; other versions include the Signature Melt, which is what happens when you turn a classic club sandwich into a melt, and the S.W. Philly “Back Again,” a Southwest-inspired melt version of a Philly cheesesteak (with a classic ’90s song reference in the title). For those in need of liquid warmth, Grill on the Gore features a full bar with signature cocktails, hot drinks and a draft beer selection that is solely from Colorado, featuring brews from the Vail Valley’s three craft breweries. McManus likes having Colorado products behind the bar as well as in the food. The well gin and vodka are from Spring 44 in Loveland; 10th Mountain Whiskey & Spirit Co.’s Rye Whiskey is the base for the Colorado Mule. 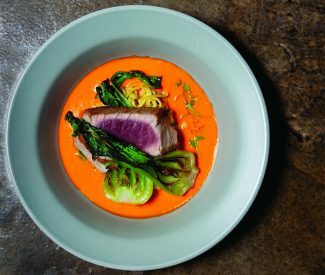 Grill on the Gore is a gem sparkling in East Vail. Take the free bus to the Vail Nordic Center stop or drive (parking is always free) and head up to the mountain modern clubhouse. Settle in with a bowl of soup and a sandwich and let your worries melt away as you gaze at the Gore Range. There are adventures to be had — Grill on the Gore will ensure you’re fueled up.